Also Recommended: Azumanga Daioh, His and Her Circumstances, Pani Poni Dash. Notes: Based on the manga by Kobayashi Jin, which originally ran in Kodansha's Shonen Magazine. It is available in North America from Del-Rey. 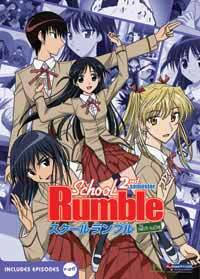 This is the second season of School Rumble. The summer, fall, and winter seasons pass by as Tsukamoto Tenma continues to try to pledge her love for Karasuma Ooji, Harima Kenji tries to confess his love for Tenma, and Yakumo and Eri each deal with their own feelings for a certain guy. One of the problems with the first season of School Rumble is that it often switched moods at the drop of a hat: after a few episodes of comedy, the series suddenly turned towards the more dramatic, then comedy, then drama again. And some whole episodes were just plain difficult to sit through, no thanks to the annoying heroine Tenma (who, sadly, is no better a character than last season). While School Rumble 2nd Semester is basically more of the same, that's not a particularly bad thing, as the balance between comedy and drama is so better and far better weighted than last season. The characters, apart from a select few, are just as enjoyable as ever, if not more so (though we still know almost zilch about Akira, and Kyousoke's and Lala's antics are no less annoying than last season). There's also less emphasis on Tenma than last season, and more on the rest of the cast as a whole (at least until the final episodes). Some of the parodies this season are pretty good, from stabs at the incredibly odd facial expressions a la Yakitate!! Japan, sports manga, mecha (again), to even an episode-and-a-half parody of Battle Royale (there's even another parody of Initial D this season, though this time it actually involves the cast)! It's not perfect, mind you. Much like the first season, there is some mediocre filler lying about, and the last thing the series really needed was a pushy female student councilor with a paper fan (it doesn't help she looks disturbingly like Narusegawa Naru from Love Hina), as well as an obligatory girl with glasses. Also, if you're hoping to see the love triangle with Harima actually resolved early into this season, forget it; almost nothing is resolved until the final two episodes. And if you're hoping for more in-depth character on Eri, you'll also be disappointed; compared to last season, her screen time is minimal. Though her relationship with you-know-who is brought up several times, at the end she's tossed aside, much like all but three of the characters in this show. The same animation studio from season one did this season, which means that the animation is just adequate and nothing more, as are the character designs; though the male cast actually look pretty diverse, most of the girls look the same except for their height, hair, and eye and hair color. Most of the BGM from season one is carried over, but the OP/ED themes did not. Instead, they're replaced by some generic J-Rock song for and OP, and a slow rock ballad-ish song for an ED theme. Neither song feels like they were written for the series...the first ending theme could've been in His and Her Circumstances had it been produced years later. The second ED theme is better and actually feels like an actual School Rumble song (though mainly because the seiyuu of Tenma and Yakumo sing it), but doesn't come into two-thirds into the series. School Rumble Second Semester is, like the first season, a mostly fun anime with a few problem here and there (dumb filler, needless drama, annoying Tenma antics, etc.). But is it still good? Yep. Not to the level of Azumanga Daioh, and it doesn't have the surreal, parody-a-minute flavor of Pani Poni Dash, but School Rumble Second Semester manages to be funny without being repetitive and boring, a feat very hard to do in a series that goes on for 52 episodes (when you count the first season). Recommended Audience: Same as season one and the OAVs; suggestive themes (Kyousoke's fondness of girls with certain breast cup sizes), an obligatory bathing scene (covered up with lots of steam), and slapstick / non-slapstick) violence.